Inspired by Nosferatu, a member of the Vault of Evil, whose unstinting gratitude offered free books to the read-hungry here’s a review of an author I much admired as a young man. David A Riley has remarked somewhere that he doesn’t read much fantasy nowadays and I’m the same. Having considered this I wondered whether a certain bleak cynicism creeps up in the middle years – fantasy becomes whimsical, less supported by any true conviction that there are better things beyond us, perhaps it becomes a childish throwback. Who knows? 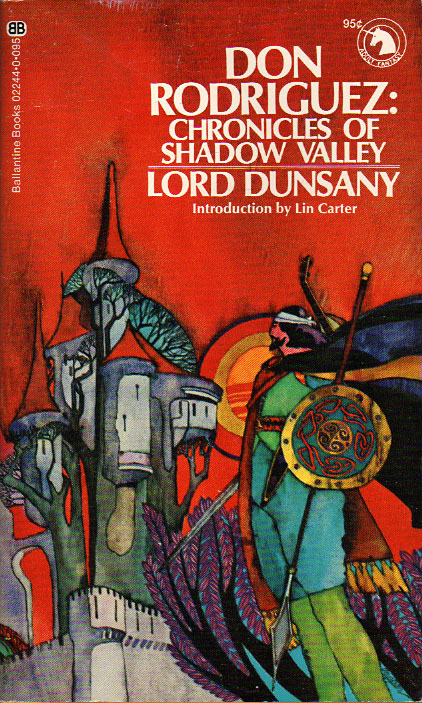 Dunsany’s, Don Rodriguez:, was published in 1922. It was his first novel and is set in a Romantic Spain that never decorated a history book because it never existed. The device of Spain seems to be a means of creating a parallel mystical world but Dunsany in this first book seemed also unwilling to risk an uncompromising fantasy world without something tangible for his readership to cling on to – hence Spain. Sufficiently far off to be romantic, sufficiently near to be comprehensible. followed maybe by an ability to create a sense of whimsical longing for other realms which would bear later fruit in more mature works; to lesser degrees its use of symbolism, its understanding of humanity and its characterization. Lovecraft’s ‘The Dream-Quest of Unknown Kadath’ was inspired in part by Dunsany but if you are a horror afficionado I wouldn’t take Rodriguez as your first door into Dunsany’s world unless it is to have a brief look at the chapter on the Professor of Saragossa which is a brilliant description of a magician and his powers. The Professor takes the hero on a journey through space to witness marvels beyond comprehension. Wish I could have gone too.